My name is Laura I am 36 and have a son (11) and daughter (9) of my own, I live with my Husband Dean, we have been together for 17yrs and married since December 2016. I enjoy spending my spare time with my family on bike rides and days out or getting involved in arty crafty things e.g. Making cushions, decorating, or reupholstering furniture. I own my own business minibus and have had a full driving license for 18yrs. I have a new assistant Carla working with me from February 2017 who is dbs checked and first aid trained. She is a parent to one of the children i care for and my best friend. she has worked as a medical receptionist and has lots of first hand experience of looking after children as she has a 11yr old and a 4yr old of her own. During college I gained experience at nurseries, schools a home setting with 8 week old triplets and a hospital. I have worked in 3 nurseries since I qualified in childcare (NNEB) at college in 2001. I have worked with children between the ages of 3months -8yrs. Then I took time out to look after my own children. My working hours are 7.30am-5.30pm, Monday- thursday but I can work a little later on occasions if needed. Unlike many other childminders, we do not charge extra for outings and our daily rate is discounted so you get a better deal with us. Below are the latest reviews for Laura W. Please note that reviews represent the subjective opinions of other Childcare.co.uk users and not of Childcare.co.uk. Parents must carry out their own checks and references on childcare providers to ensure that they are completely happy before enaging in the use of their services. My daughter has been with Laura for the last 12 months and has loved every minute. Every morning Lily is smiling and happy to see Laura and the other children. Laura and the whole family embrace the children they look after in a warm and caring environment. Laura has looked after our little boy since he was 5 1/2 months old. We were really worried about leaving him at first, but he loves it there. He always has a smile for her in the morning and is happy when collected. They have been on lots of outings to various parks and play areas, and I love getting cards and other creative things he has made for me. Cannot praise Laura and Dean enough providing excellent facilities and stimulation for the children. A professionally run childminding service that I cannot recommend highly enough. 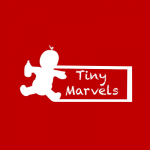 If you are looking for a excellent childminder then look no further than Tiny Marvels. I have been very happy with the level of care Laura has provided for my daughter. Ever since starting there she has helped my daughter improve her speech significantly as well as helping her to progress through her key stages. Laura always has lots of fun and exciting activities planned for the day no matter what the weather may be like. It is very reassuring knowing my child is in safe hands and having fun.